As a member of Microsoft Learning Rewards Program, I want to share with you my experience on Microsoft Certification on MS Visual Studio. Especially on this certification guide, I will deal with Microsoft Visual Studio 2008 Certification Paths. I know that for developers working with .NET Framerwork either coding in C# or VB.NET is even a basic question related with certification exams. In this Microsoft VS2008 certification guide, I'll try to explain the common basic questions on exams and getting certified, certification titles and prerequisites, etc. I will also share Microsoft certification offers like free Microsoft certification vouchers, Microsoft certification discount voucher codes and second shot voucher codes as much as I can promote. 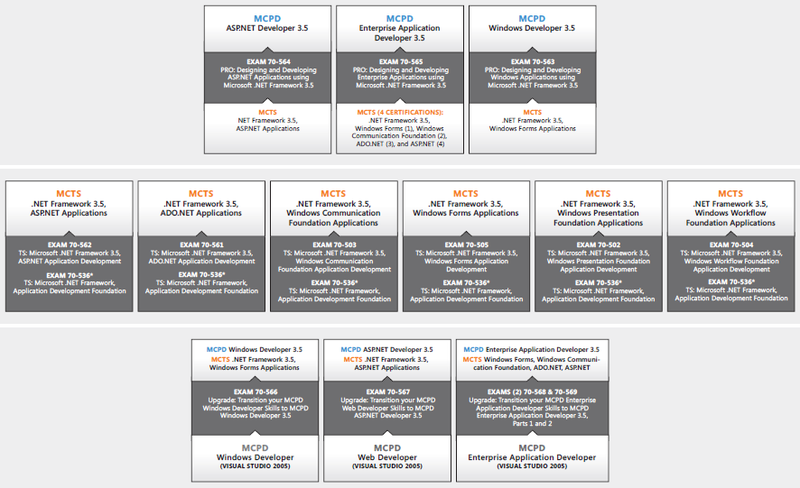 Let's say even 5 years ago when the MCAD and MCSD certifications were still meaningful and living the last period of their brilliant times, the certification paths, the prerequisite exams and prerequisite certifications, the choice of programming language were still questions on many developers studying for Microsoft certifications. I know from my developer friends that even the optional exams were confusing many of them. I still see many posts on certification forums related with Microsoft certifications, exams and certification exam questions. I believe that Microsoft has also realized the confusing situation and wants to clearify the certification questions on the minds of developers and IT professionals. I think Microsoft Learning Rewards Program is a result of such an effort to share the knowledge with Microsoft certification candidates via experienced certification publishers. So let's talking on Microsoft Visual Studio Certification Paths now. So I'll start with sharing you the official documentation from Microsoft Learning titled Microsoft Visual Studio Certification Paths for your free download. I believe this certification resource will help many developers planning to take Microsoft Certifications on Visual Studio and .NET development. An other free Microsoft certification offer is Microsoft Certification Exams Second Shot Voucher Code. For details please read my certification blog post Free Second Shot Offer for Microsoft Certification Exam. Note that these free voucher codes are valid until Jun 30, 2010.